In golf’s long history most everything to help golfers and their games has been tried in one form or another from clubs to balls to footwear, etc. So when Performance Sports Brands announced they had a shirt to produce a competitive advantage for the wearer, the yawns could be heard from the locker room to the first tee. However, the new hi-tech fabric being used for the shirts is said by the company to give the wearer more power. 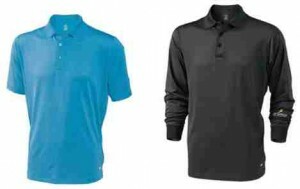 The idea behind their Energy Athletic Golf apparel is the technology of the patented IonX Ionized Energy Fabric with a negatively charged electromagnetic feature inherent in the fabric. The science behind Energy Athletic Golf fabric was developed by Dr. Al Oiumet who formerly did work on the Fastskin Swimming Suits for Speedo used in the 2000 Olympics. His golf roots go way back, his great uncle is Francis Ouimet who, in 1913, was the first amateur to win the U.S. Open Championship. Golf shirts, both long and short sleeve, made with the fabric are available on http://www.wearenergy.com and are priced from $69 to $79.